shine brite zamorano: and off we go! Below are a few pics of the classroom before the kids came through. Quote on the left- "To live a creative life we must lose our fear of being wrong." I'm color coding the tables this year and releasing students whose tables are clean and quiet by simply showing them a card with the table's color on it. One of the ways I'm aiming to manage with non verbal cues. Some "new" posters. I really like the Grant Wood one at the top. Hand signals for a few common classroom issues. Students rotate to me during the school year for two weeks and then they are off to another instructor for the next two weeks. Kathi, the other art instructor, does not meet with classes the first week of school, so I do mini lessons with as many classes as I can that/this first week. This year I will see all the 3rd, 4th, and 5th grade classes for 30 minutes each. This is a great opportunity to go over the classroom rules and to get the kids back in the swing of things. It's difficult to do a project in 20 minutes, so I have them work on a large collaborative project. Last year I did a project inspired by a few pieces by the artist Lee Gainer (which has brought a bunch of traffic to the blog:). I decided to do another collage this year, as it allows me to use a bunch of leftover paper from the past year. 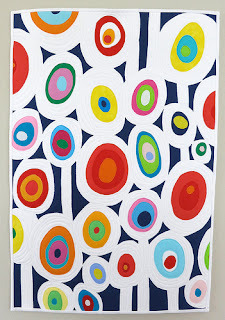 I found a quilt done by Carol at the blog mamacjt and loved the bold colors, the repetition of round shapes, and how the composition was jam packed. I also thought it was cool that her quilt had so many round shapes, since most of the quilts I have shared with the students use mostly squares, rectangles, and triangles. Her quilt was, in turn, inspired by a painting done by Georgia Gray. So, the kids are building a collage inspired by a quilt inspired by a painting. It's a pretty simple activity. Students start our with 3 sheets of paper- big, medium, and small. They fold each once or twice and then cut out round shapes from those sheets. Once their shapes are cut out, they glue them together, and then onto the big (24x36") sheet at their table. I emphasize, especially for the classes that came after the first one, that they should think about the best places for their shapes. I ask them to respond to the composition as it fills up. Once the sheets are pretty full (about 3 classes) I ask the next group to draw round shapes around their cut paper "targets". Students then fill in the spaces that are left in between the white ringed targets. It took 5 classes to complete the collages in the images below. I figure to have at least 12 more by the end of class on Friday. I will hang them in the back of our auditorium when they are finished to serve as a beginning of the year temporary public art project. just realized that this was my 200th blog post. Pretty neat in an odometer sort of way. Glad I've kept up with this for the past couple years. I'm looking forward to many more! Congrats on your 200th post - I am right about there myself. Nice group project, I always enjoy your blog. GENIUS idea about dismissing by holding up table colors! I will try this with my table numbers. I talk WAY too much. Another great collaborative project! You are so good at planning these out. I'm glad you've kept up with this blog - I am constantly inspired. I saved this same quilt picture to use later in the year with kids. LOVE your kids' results!! I read that you are color coding your tables. Sounds like a good plan. I did the same many years ago. I choose one member of my helper table to be the one that lines everyone up. If nothing else goes right that always does. Most kids like the responsibility and power associated with this job:P Hope you have a good year! I bow down to you, Sensei! Another outstanding post and it was your 200th to boot! You always inspire me and your students are very lucky to have you for an Art Teacher. thanks yall! i cant wait to see what YOU are all up to this year too! Oh my, I love your project and feel so honored that my quilt inspired you to do this with your students. They did a marvelous job and the end result with all the creations together is awesome! Please tell them for me that "now I am impressed with their artistic genius"!! Wow! Such a striking collaborative project! Kind of a new twist on Kandinski's circles. I may have to "borrow" this sometime. Congrats on your milestone! I am visiting through Carol. I am amazed at the incredible art project you came up with. And the kids are fabulous! Just came over from Carol's blog.....the kids did an awesome job with this project! I love them all hanging together at the end. It has such impact! Love it! Hi, I too popped over here from Carols' - what a great idea to get all the students working together. Carols work is awesomely artistic! I love the idea of the colours and hand signals! I came over from Carol's Blog - this project is so cool and I love that you had the different classes collaborate! My children had a wonderful art teacher when they were in grade school too - thanks for being a teacher! I came over from Carol's blog too. I like the chain of inspiration, and how you've inspired your students to inspire the rest of us. the collages look fabulous on the wall -- sort of like a big quilt! I'm also a visitor from Carol's blog. I love how you put together the project and let the kids work on it in a collaborative manner. The end result of all the pieces together is very striking. Beautiful! I teach after school at three schools, so no art room for me! I envy your great space and room to work large. I love the collaborative way you approached this. I'm also a quilter, so this appeals to me on than level too. Thanks for sharing! I came from Carol's blog as well. I am honored to have one of her wonderful mini quilts hanging by my computer. I love how you turned her mini quilt into a class project! It is wonderful to see art in schools! Hi, did you give any guidelines about color choice to unify each large sheet? Also, what are they filling the background negative space in with? Watercolor? before each class came in i replenished the big, medium, and small pieces at each table. they were welcome to use leftovers that other students had left behind, so i had a hand in the unifying colors. the background is done with crayons. Great project! I really love the way you run your classroom. As a child, I would have responded well to this environment. My children would have found this type of classroom a very safe place to be creative, and it seems learn other lessons along the way. totally awesome work! makes me want to go back to school! found you via Carol's blog! She is indeed very talented as are you students who have done AMAZING work! I would be proud to have any of their efforts on my (rather bright!) walls Downunder! Love the project! Looks like it would be a lot of fun, and the end result is great! Wow is right... inspiring and great to know that kids are getting the chance to experience their own creativity. I looked at last year's project too. I loved your statement about unitformity and variety. Too much of either is not good. I will try to remember that! And Carol is a great inspiration no matter the medium. I am SO DOING THIS. I recognised the Georgia Gray influence straight awway. Love it! Ah, she's an Aussie like you:) Is she very well known in country? love all those wonky circles! can I be in your class? Wonderful project! Where can I find biographical info on Georgia Gray to share with students? Her blog looks to be only images. Love your projects! Did you paint the backgrounds of the finished works with watercolor? Kelsey, the backgrounds are done with crayons. I asked students to press hard to get the vibrant color.